Send "love hugs" from Beary to your sweetheart. Comes with a bottle of dazzling La Rive Concept for Men . Inspired by Lacoste Challenge, this citrusy fragrance ideally combines citrus and ginger notes dedicated to men who are dynamic and eager to take on challenges. 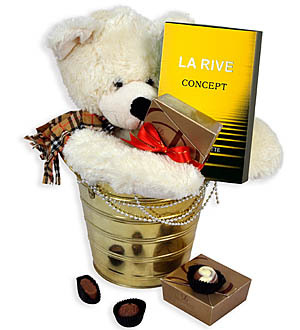 Nothing is sweeter than a seductive fragrant from La Rive (Poland) with luscious Decadence Praline. Next day delivery applicable for Klang Valley only. For out of Klang Valley, kindly allow 3-5 working days delivery. For more information, call 03-78830233 / 012-6915200.